On a whole we were satisfied with the trip other than the massive jam since it was a long weekend for the folks. My driver/guide, Ropan, was friendly and knowledgeable about the history and culture of Bandung which we have learned a lot. Set among the lush green forests of the Ciwidey area, the enchanting Kawah Putih Crater Lake offers all nature lovers and adventure-seekers an opportunity to immerse themselves in the true, untouched beauty of nature. Explore this gorgeous destination without having to worry about transportation and the like with this eight-hour tour from Bandung! Get picked up by your guide at your hotel/accommodation, then immediately head 50 kilometers south of the city to get to Kawah Putih. Once you're there, check out the stunning sight of the lake, surrounded locals and campers milling about. Walk along its clear waters as you take photos, before you travel to Glamping Lakeside, a resort located by Kawah Putih. 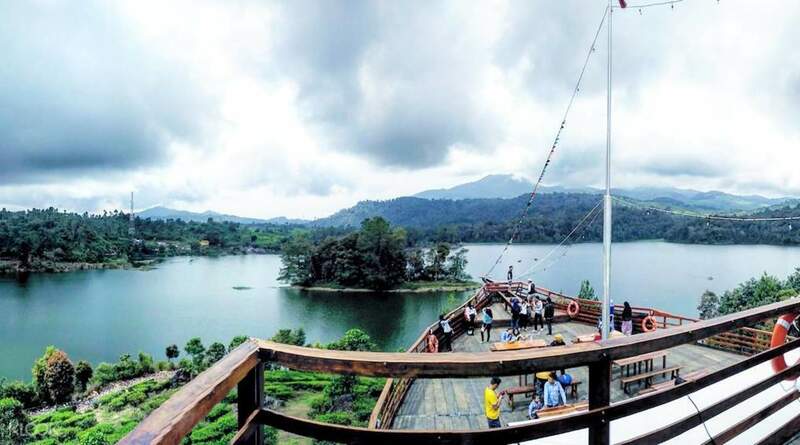 Take a quick break for lunch at the nearby restaurant that's shaped like a ship, at your own expense, then go on an exploration of Rancabali Tea Plantation. 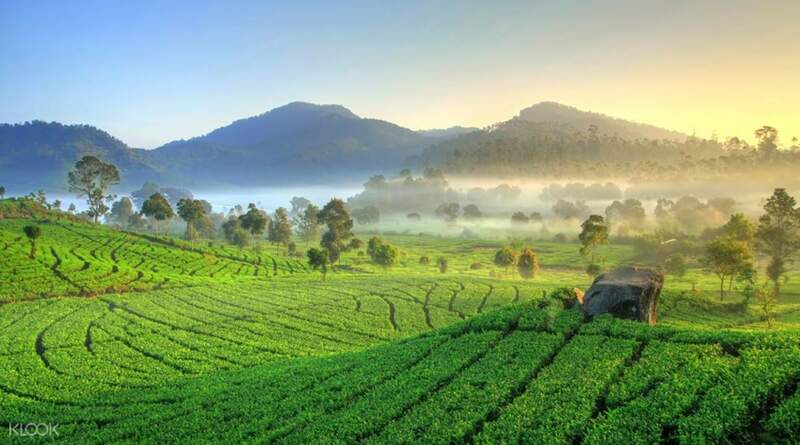 One of the most beautiful tea plantations in Bandung, you'll get to learn about how it runs on a day-to-day basis from your English-speaking tour guide as you wander through the tea bushes. 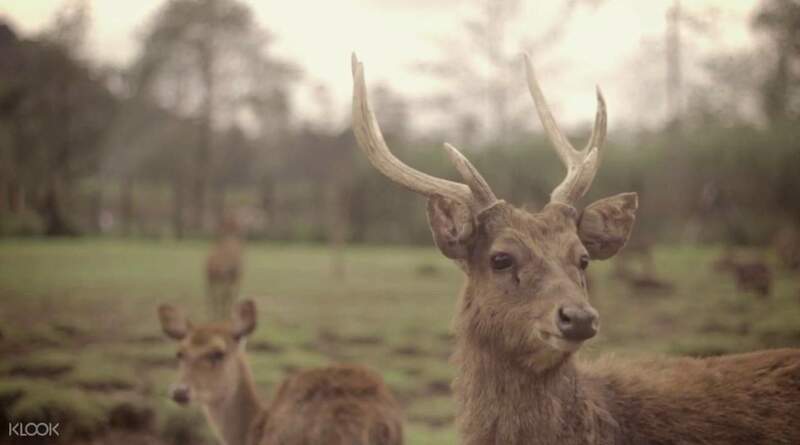 Get up close and personal with the wildlife at Rancaupas Deer Conservation Center, where you'll get to see cute deer and maybe even pet them by buying some treats! Your last stop for the day is a local strawberry farm, where you'll get to pick and sample tasty strawberries, before you pack up and get dropped off back at your hotel. Enjoy a delicious meal (at your own expense) at the restaurant at Glamping Lakeside! 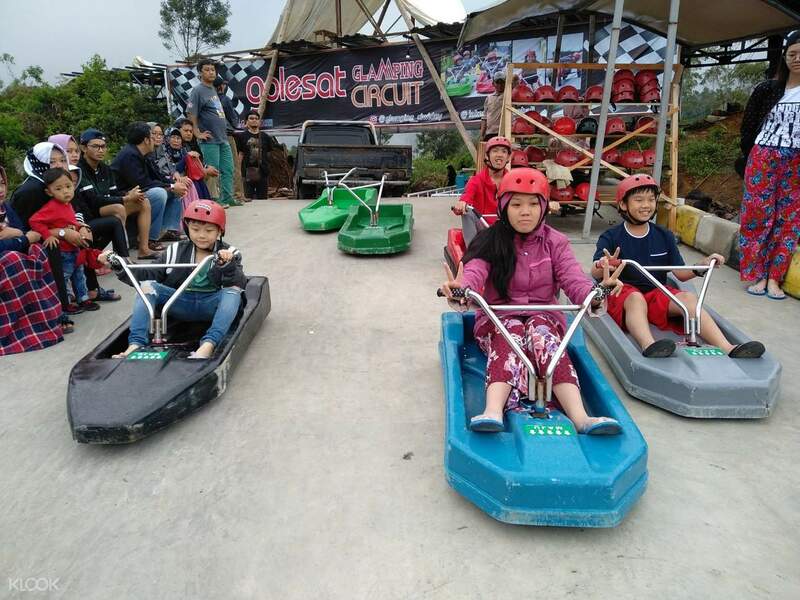 Get a dose of adrenaline rush on a fast toddler go-karts your kids will surely love! this is first time i booked a tour package with klook, i booked the tour package to kawah putih and tangkuban perahu.. and we met a fantastic driver and tour guide, Ega.. he suggested to start the tour earlier to avoid the bad weather and the crowd, which turned up to be a brilliant idea.. Ega is very flexible with the schedule.. he checked with us on our preference and adjusted the schedule accordingly.. he knew really well about bandung, helped us to take wonderful photo and recommended good food.. he is also a person very nice, open-minded and funny to talk to.. thank you Ega.. really appreciate on your companion these two days.. will surely return to bandung and Indonesia again!! five star!! this is first time i booked a tour package with klook, i booked the tour package to kawah putih and tangkuban perahu.. and we met a fantastic driver and tour guide, Ega.. he suggested to start the tour earlier to avoid the bad weather and the crowd, which turned up to be a brilliant idea.. Ega is very flexible with the schedule.. he checked with us on our preference and adjusted the schedule accordingly.. he knew really well about bandung, helped us to take wonderful photo and recommended good food.. he is also a person very nice, open-minded and funny to talk to.. thank you Ega.. really appreciate on your companion these two days.. will surely return to bandung and Indonesia again!! five star!! 1st time I am using Klook for my tour. everything was well planned and I would highly recommend my driver, Mr Steven! He is very accommodating and helpful. Without asking for help to take photos, he will automatic took for us. He will tell us which is the nicer spot to take and he took great photos. He even helps us to reject those agressive local sellers. The lunch place he recommend was bomb! The local foods is so good and very affordable. I will definitely request for him in my near future trip in Bandung again. Once again, Thank you Mr Steven for your super service . 1st time I am using Klook for my tour. everything was well planned and I would highly recommend my driver, Mr Steven! He is very accommodating and helpful. Without asking for help to take photos, he will automatic took for us. He will tell us which is the nicer spot to take and he took great photos. He even helps us to reject those agressive local sellers. The lunch place he recommend was bomb! The local foods is so good and very affordable. I will definitely request for him in my near future trip in Bandung again. Once again, Thank you Mr Steven for your super service . Had a great time with the tour. Lovely scenery (kawah putih and tea plantation). We enjoyed feeding the deer. We did a side trip to a hot spring (too bad we didn’t bring extra clothes) and boiling of eggs. Our tour guide Steven from rajatour is very accomodating and super nice. He was able to extend his hours to visit other places. Had a great time with the tour. Lovely scenery (kawah putih and tea plantation). We enjoyed feeding the deer. We did a side trip to a hot spring (too bad we didn’t bring extra clothes) and boiling of eggs. Our tour guide Steven from rajatour is very accomodating and super nice. He was able to extend his hours to visit other places. Worth visiting!! 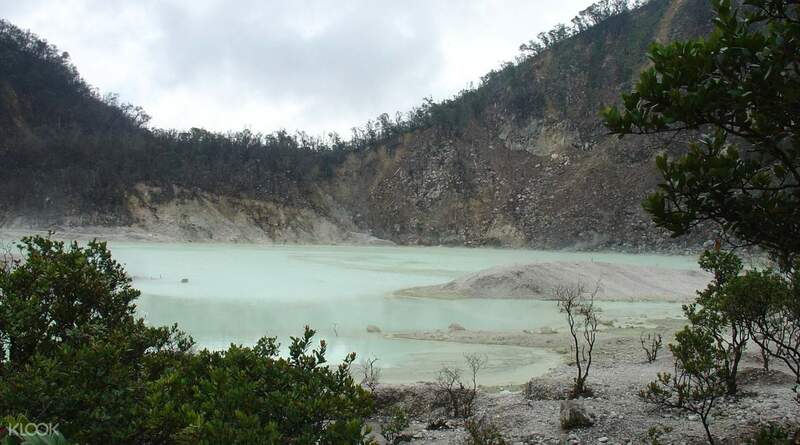 Kawah Putih is beautiful and the place had some mystery aura to it! The package is affordable for the 2 of us and it's a private tour instead of like a join in group tour. We are glad that our driver, Mr Cokey, are informative about the places that we visited. We did received some fun fact about Kawah Putih, Tea Plantation , and the Deer Conservation Center. He is very punctual too for all our pick up including the airport arrival & departure, plus the private car carter. I also would like to shout out to KLOOK Hotline Customer Service for the quick response & patiently follow up to my previous booking due to I had accidentally booked wrongly. We already recommended KLOOK to our friends & family who plans to travel Japan & Thailand because we found that it's reliable and the also the GOOD customer service from all aspect. Impressive!! Worth visiting!! Kawah Putih is beautiful and the place had some mystery aura to it! The package is affordable for the 2 of us and it's a private tour instead of like a join in group tour. We are glad that our driver, Mr Cokey, are informative about the places that we visited. We did received some fun fact about Kawah Putih, Tea Plantation , and the Deer Conservation Center. He is very punctual too for all our pick up including the airport arrival & departure, plus the private car carter. I also would like to shout out to KLOOK Hotline Customer Service for the quick response & patiently follow up to my previous booking due to I had accidentally booked wrongly. We already recommended KLOOK to our friends & family who plans to travel Japan & Thailand because we found that it's reliable and the also the GOOD customer service from all aspect. Impressive!! We continued our laughter with Mr Ega on our second day tour with him. We booked private tour to Kawah Putih, included tea plantation and deer park. He is also very kind to carry 2 big umbrellas with him during sightseeing as he was afraid might rain. He also made memorable, lovely, beautiful video clip and forward to us after our trip. Despite the worse heavy traffic jam we had experienced so far, we still completed the itineraries with so much fun. Thumbs up for Mr Ega! We continued our laughter with Mr Ega on our second day tour with him. We booked private tour to Kawah Putih, included tea plantation and deer park. He is also very kind to carry 2 big umbrellas with him during sightseeing as he was afraid might rain. He also made memorable, lovely, beautiful video clip and forward to us after our trip. Despite the worse heavy traffic jam we had experienced so far, we still completed the itineraries with so much fun. Thumbs up for Mr Ega! We highly recommend Ega as our tour guide. He can speak english fluently. While on tour he keeps on telling us about the history of some tourist spot. He even suggest where is the good place to eat. We are so happy with the photos he took us. Thank you so much for the hassle-free tour. We highly recommend Ega as our tour guide. He can speak english fluently. While on tour he keeps on telling us about the history of some tourist spot. He even suggest where is the good place to eat. We are so happy with the photos he took us. Thank you so much for the hassle-free tour. Enjoyed this tour so much! We came in a large group (18 pax), Klook and its official partner we're able to pull it off! Gita and Angga, our tour guides have been great in accomodating our needs. They explained everything from history to techniques so that we could fully enjoy and maximize the tour. The recommended restaurant is also a thumbs up! Hats off to the team! They love it! Thank you! Enjoyed this tour so much! We came in a large group (18 pax), Klook and its official partner we're able to pull it off! Gita and Angga, our tour guides have been great in accomodating our needs. They explained everything from history to techniques so that we could fully enjoy and maximize the tour. The recommended restaurant is also a thumbs up! Hats off to the team! They love it! Thank you! My Husband and I went on this tour in April2018. The guide was very informative as he shared stories, history and culture of the places we were visiting. Although I did not realised the phone number I gave was from the local number of my last destination and they could not contact, the guide actually went into the hotel to look for us and send me emails in attempt to reach us. By the end of the tour, he actually gave us a small souvenier and all through the trip he spoke good English so we have no problem at all understanding him. My friend went to bandung a month later and she took the same tour as per my recommendation. She enjoyed it very much as well. Thank you KLOOK! My Husband and I went on this tour in April2018. The guide was very informative as he shared stories, history and culture of the places we were visiting. Although I did not realised the phone number I gave was from the local number of my last destination and they could not contact, the guide actually went into the hotel to look for us and send me emails in attempt to reach us. By the end of the tour, he actually gave us a small souvenier and all through the trip he spoke good English so we have no problem at all understanding him. My friend went to bandung a month later and she took the same tour as per my recommendation. She enjoyed it very much as well. Thank you KLOOK! We had a excellent trip to kawah putih and deer conservation plus strawberry. We enjoyed too much.The itinerary and package provide my klook is excellent and all are provided from entry ticket plus driver/tour guide and a car. We had Mr Ropan as our excellent driver/tour guide through the trip. He accomodate our needs during the tour. Thank you so much to our Mr Ropan. You did a great job. I recommend those whose are visiting bandung to use klooks as ur choice for tours. We had a excellent trip to kawah putih and deer conservation plus strawberry. We enjoyed too much.The itinerary and package provide my klook is excellent and all are provided from entry ticket plus driver/tour guide and a car. We had Mr Ropan as our excellent driver/tour guide through the trip. He accomodate our needs during the tour. Thank you so much to our Mr Ropan. You did a great job. I recommend those whose are visiting bandung to use klooks as ur choice for tours.